Even Californians travel in their own little sphere of work, friends and family. They don't see the homeless tent cities. The unincorporated communities that lack sewer systems, sidewalks, street lights and even clean drinking water. The places where the people who grow our food and clean our hotel rooms live. This is that California. The real California. 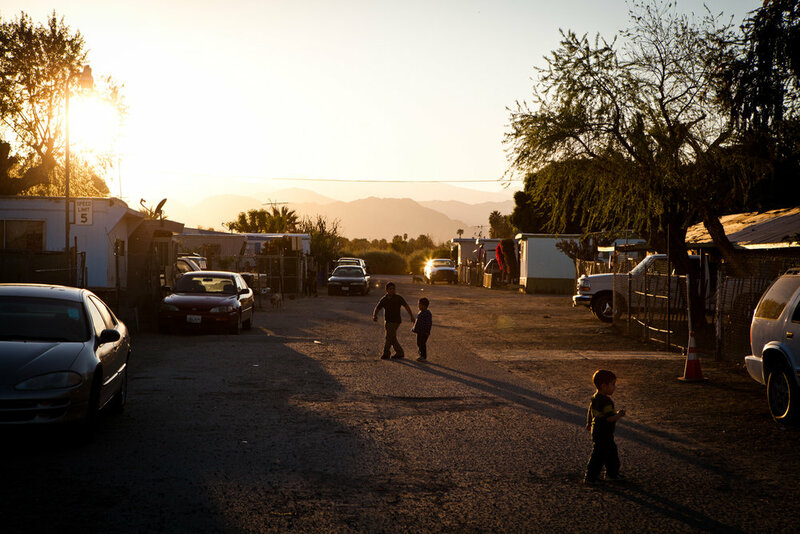 Small children peer out of a trailer in the Rancho Garcia trailer park in Thermal, California. Across California there are hundreds of unincorporated communities like Thermal. While a few are some of the state's richest areas; most lack sewer systems, clean drinking water, sidewalks, street lights, and storm drains. Populated by poor, working class Latinos, they're neglected by local government and lack the resources to install the most basic infrastructure that city residents rely on. From left, Sheldon Eilers, 10, and Alexa Taylor play in the backyard of a Scotia, CA home on Tuesday, June 27, 2006. The town of Scotia in Northern California is a company town owned by the Pacific Lumber Company (PALCO), but that will change as the company will begin to sell the town. Farmworkers harvest corn silage on Brannan Island in California's Delta. Grapes are harvested in the Bogle vineyard near Clarksburg, California. 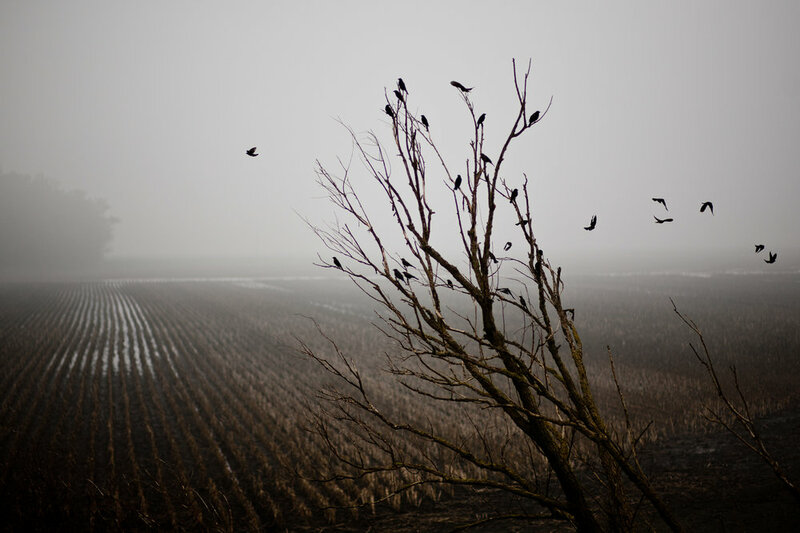 A winter scene in California's Delta, where much of California's scarce water supply passes through. An unfinished housing subdivision lies abandoned after the housing bubble burst on the outskirts of Sacramento, California. Carol Couts poses for a portrait at the Yuba City, California home that she'll be evicted from after owning it for over 30 years. Baptism at megachurch in Roseville, California. Members of Stockton's Community Response Team question mourners at the site of a memorial for five people shot the night before in Stockton, California, September 18, 2013. Facing stark and rising homicide rates, the California cities Oakland and Stockton are taking a second chance at a novel method of disrupting street gangs, called Ceasefire, in which the police use social-analytics software to map out connections between a cityís most violent gang members, using the data to make targeted and coordinated arrests. A couple kisses as they're separated and arrested after a handgun and drugs are found in their car during a traffic stop by the Community Response Team in Stockton, California September 18, 2013 which targets violent gangs. The officer found a handgun and heroin in the car. Facing stark and rising homicide rates, the California cities Oakland and Stockton are taking a second chance at a novel method of disrupting street gangs, called Ceasefire, in which the police use social-analytics software to map out connections between a cityís most violent gang members, using the data to make targeted and coordinated arrests. The Rutter family hangs out in front of their Parklawn home in Modesto, California. Across California there are hundreds of unincorporated communities like Parklawn. While a few are some of the state's richest areas; most lack sewer systems, clean drinking water, sidewalks, street lights, and storm drains. Populated by poor, working class Latinos, they're neglected by local government and lack the resources to install the most basic infrastructure that city residents rely on. 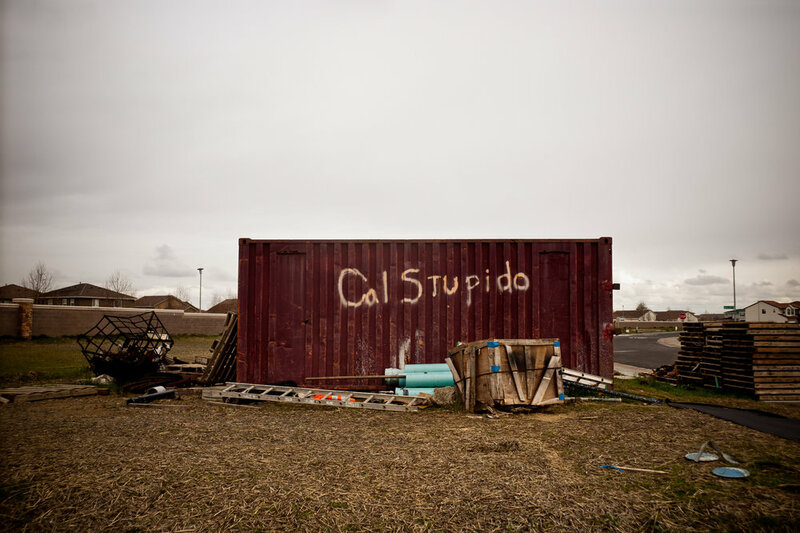 After the county shuts down the Andina Village trailer park in Olivehurst, California, resident Linda Zachary strips metal off an abandoned trailer to sell for scrap. Evelyn Marrs-Benn, left, and Chanae Hanger hang out at the SafeGround homeless tent camp in Sacramento, California. Vickie Stanphill has been homeless for over two months in Fresno, California. A resident of a homeless tent camp in Fresno, California. 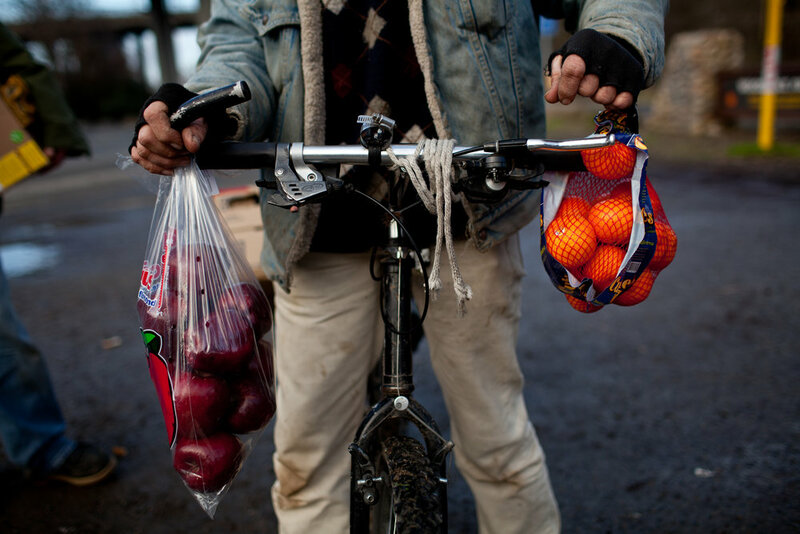 Tim Buckley brings donated food back to the SafeGround homeless tent camp in Sacramento, California. Campers stay warm in a tent heated by a propane burner at the SafeGround homeless tent camp in Sacramento, California. An overflow crowd of homeless men take up every cot and use mats on the floor to sleep at Stockton's Shelter for the Homeless, July 18, 2012. With some of the highest rates of unemployment and home foreclosures in the country, Stockton, the largest US city to declare bankruptcy, is grappling with large numbers of homeless. Amanda Barnes and her two-year-old son Brandon relax in their only vehicle, a pickup that is more often broken than not. Ten-year-old Benito Tirjeron jumps over a puddle on the edge of the Parklawn neighborhood in Modesto, California. Across California there are hundreds of unincorporated communities like Parklawn. While a few are some of the state's richest areas; most lack sewer systems, clean drinking water, sidewalks, street lights, and storm drains. Populated by poor, working class Latinos, they're neglected by local government and lack the resources to install the most basic infrastructure that city residents rely on. Parker Stanphill, who suffers from mental health issues, lives homeless on the streets of Fresno, California. 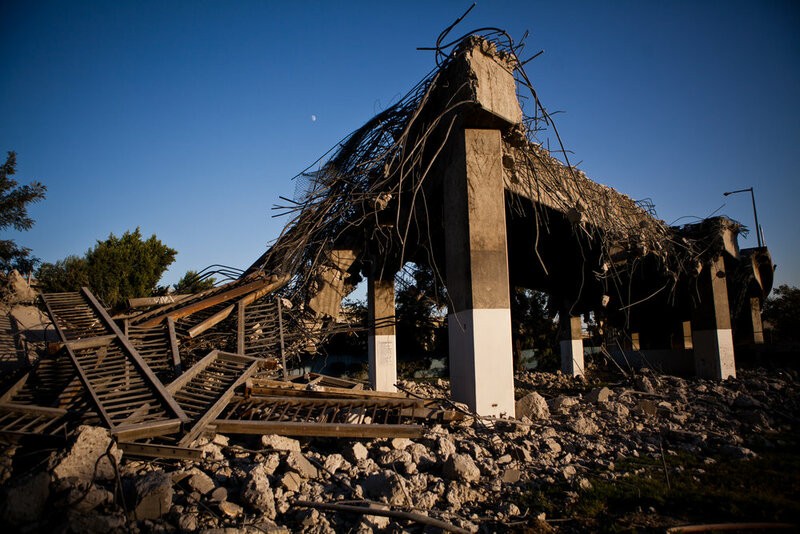 The remains of a former SafeGround homeless tent camp that was flooded out in Sacramento, California. A thirft store sells used clothing in downtown Fresno, California. 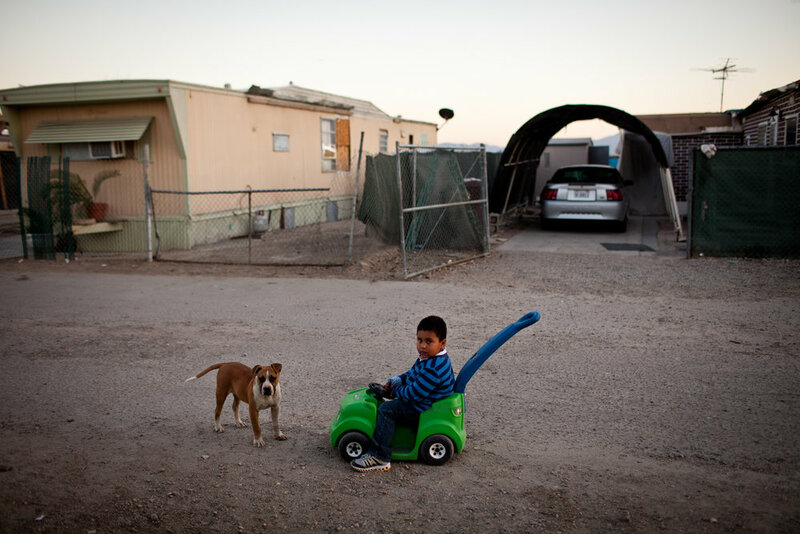 A three-year-old boy plays in the Rancho Garcia trailer park in Thermal, California. The Rancho Garcia trailer park in Thermal, California. Across California there are hundreds of unincorporated communities like Thermal. While a few are some of the state's richest areas; most lack sewer systems, clean drinking water, sidewalks, street lights, and storm drains. Populated by poor, working class Latinos, they're neglected by local government and lack the resources to install the most basic infrastructure that city residents rely on. A structurally unsound highway ramp is destroyed in Fresno, California. A abandoned Dunmore Homes development in Elk Grove, California. The company has filed for bankruptcy. Even Californians travel in their own little sphere of work, friends and family. They don't see the homeless tent cities. The unincorporated communities that lack sewer systems, sidewalks, street lights and even clean drinking water. The places where the people who grow our food and clean our hotel rooms live. This is that California.